Hugging close to the coastline of Dikwella, Ani Villas Sri Lanka is an expansive beachfront villa complex containing two individual villas - the eight bedroom Villa Monara, and seven bedroom Villa Divia. Set upon a sprawling tropical garden, the villa complex sits atop a bluff on the central south coasts, commanding a stunning view of pristine white shores and azure blue waters. A luxury vacation rental like no other, Ani Villas Sri Lanka boasts lush amenities, fine interiors and impeccable service. At the end of a fun-filled day, it is time to sink down into a deep slumber. 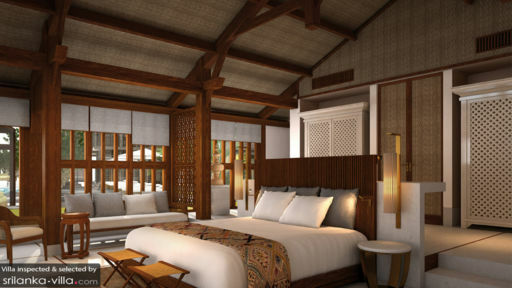 Holidaymakers at Villa Monara will gladly retreat into the well-appointed bedrooms within the villa. Four of the bedrooms are capacious master suites, while the remaining four are suites. Set upon a sprawling garden, the picturesque grounds of Villa Monara contains tropical blooms and towering palms. Guests at this dreamy vacation abode will enjoy lounging about in the breezy open plan salas, or taking dips in the expansive beachfront swimming pool. A children’s pool with water slide facilities ensures that the young ones will have a wild time frolicking out in their water playground. The arrival of dusk is a signal for vacation makers to slip out of the swimming pool, and make their way towards the pool bar for a round of sundowners. 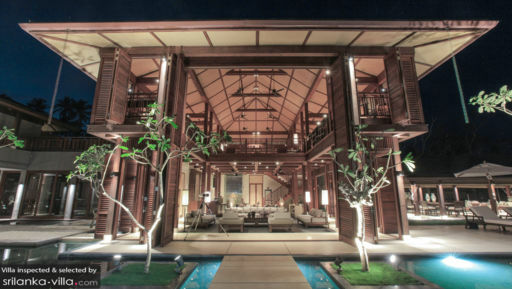 Built for rest and relaxation, the interiors of Villa Monara are a pleasing and comforting sight. Wooden fixtures and light colours create an ambience of cosiness, while tasteful ornaments spice up the soothing simplicity of its interiors. Guests can enjoy a quiet evening browsing through their favourite books in the library, or indulge in a cheerful session of games and film watching in the entertainment room. 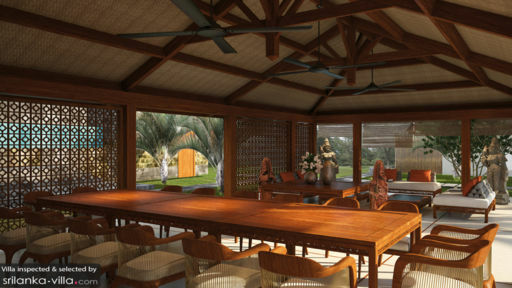 Travellers residing at Ani Villas Sri Lanka will have a plethora of travel activities to choose from. Water sports enthusiasts will have a fine time riding the waves on a surfboard, or venturing out to the sea for a fascinating session of whale watching. Nature lovers may embark on an insightful visit to one of Sri Lanka’s gorgeous animal reserves, while cultural buffs will delight in taking an expedition to explore tea plantations located close by.